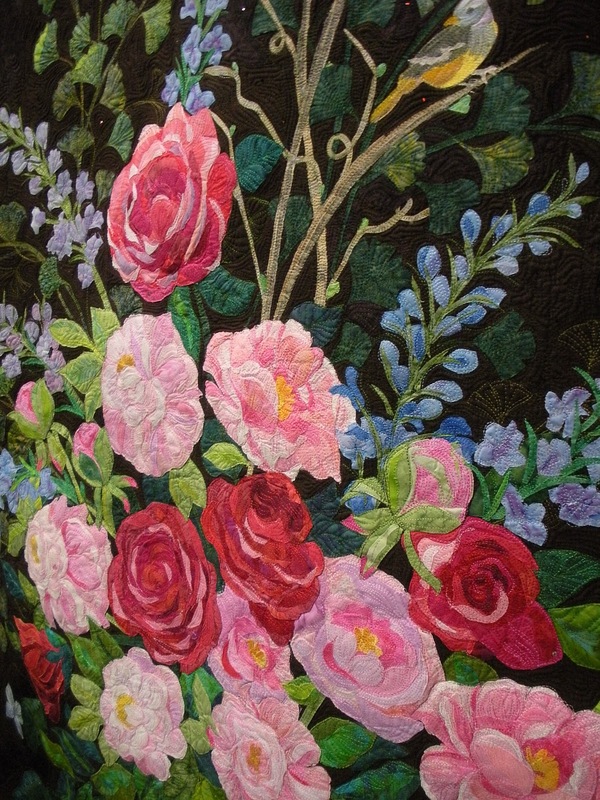 I can’t show you any of the quilts from the AQS Contest portion of the show, but I can show you some eye candy from the Des Moines Quilter’s Guild portion of the show, and maybe a detail shot ot two to spark your creative mojo! It’s a Victory Quilt (I assume because of the V shape it repeats in the block?) and hung in a special exhibit of 20th Patriotic Quilts. I really should have taken more photos in that section. There were some pretty impressive quilts. Realistic artistry… 3-dimensional elements…. Many of them are just spectacular. 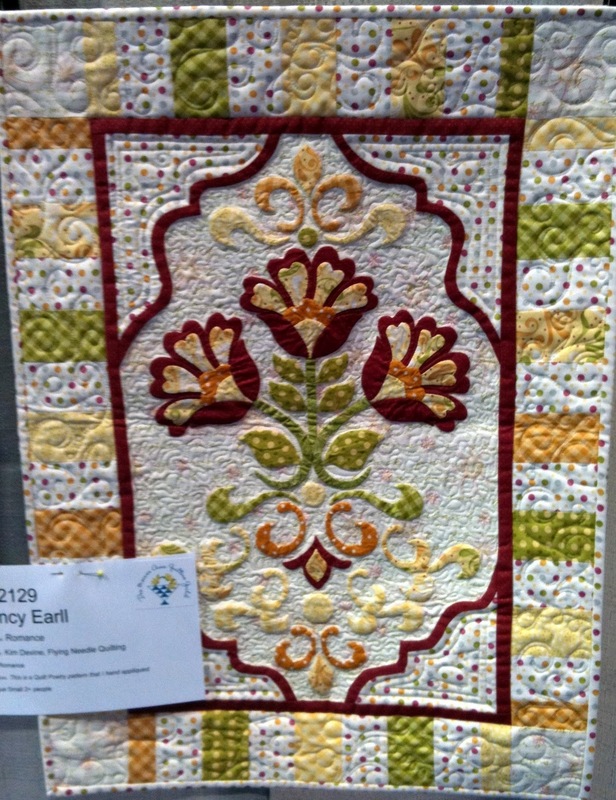 This little hand-appliqued quilt was made by a friend of mine, out of the lovely Sweetwater Sunkissed collection, with red compliments. It was lovely! She had an entry in the AQS Juried Contest as well. 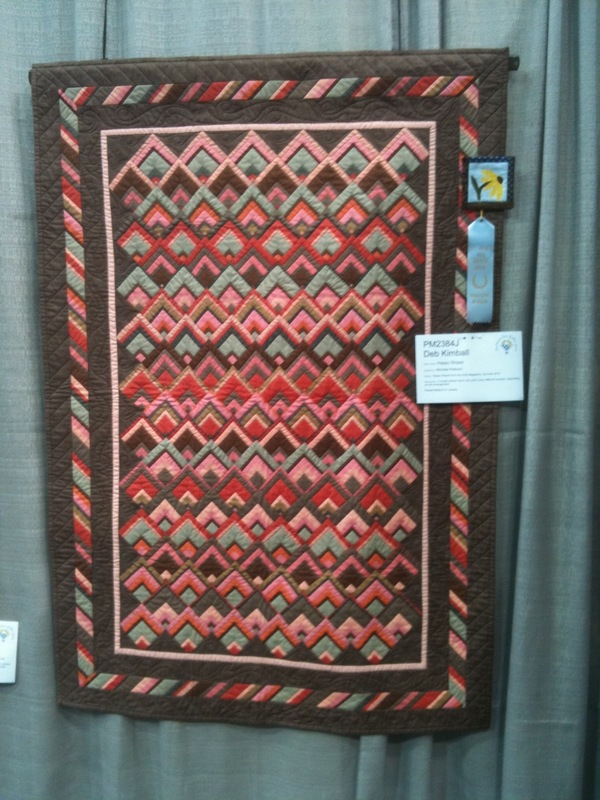 This is a terrible photo of a great, contemporary looking quilt made from striped fabrics. It has a 3rd Place Guild Ribbon attached to it. And another with a definite modern flair, see all those little hexagons in the border? Also a 3rd Place Winner! There were eleven rows of vendor booths to peruse as well as all the exhibits. I came home with a spool or two of Aurifil thread, five half-yard pieces of fabric, and some new templates. Not to mention sore and tired feet, but who cares?! 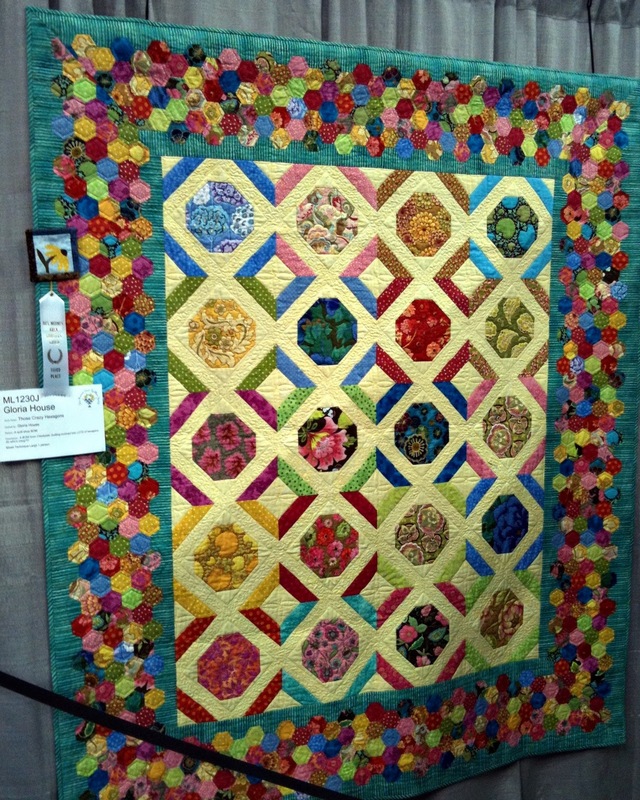 I got to spend eight hours at a quilt show! Still time to get in on my Aurifil Giveaway! 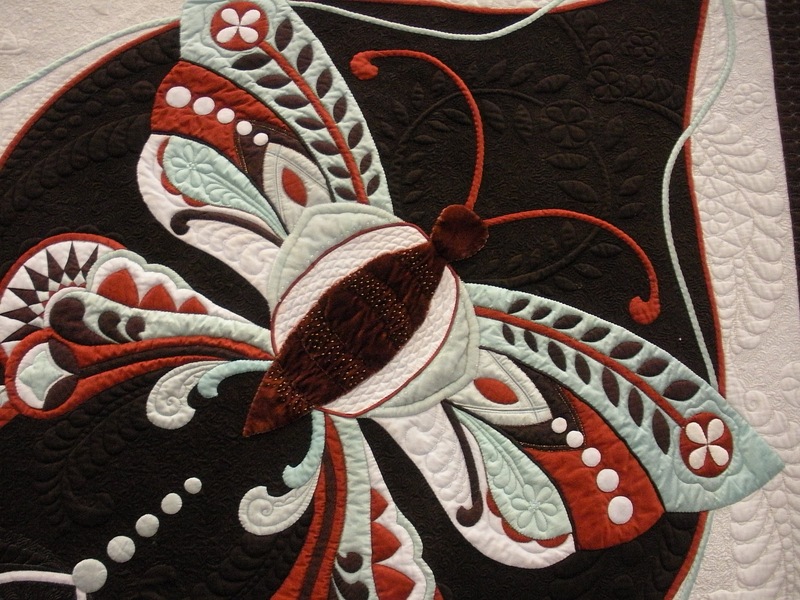 I love to SEE everyone's quilting… I'm a dork…. Thanks for sharing your show pictures. 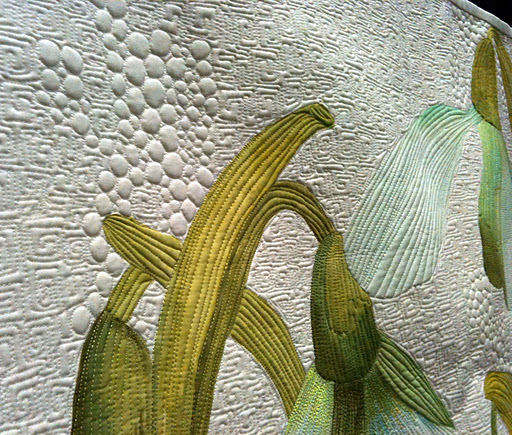 I didn't take photos unless it was close-up shots of quilting. I understand why you love the Victory Quilt. I do too! 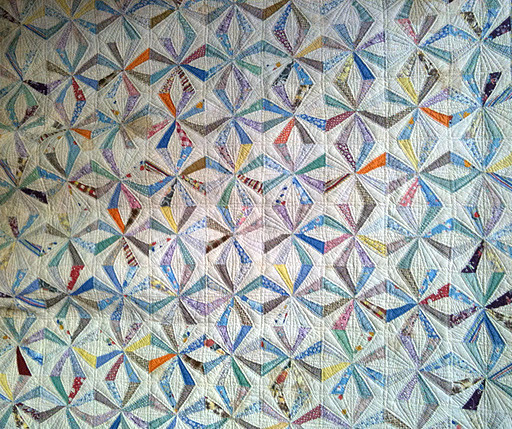 I have a foundation paper pieced pattern for it, from an old Australian quilt magazine. It's in my “someday” pile. Such beautiful things. Sorry I missed it. Thanks for sharing.